An opportunity to see the different aspects of Agadir often missed by the visitor. The splendid view from the hilltop kasbah, the site of the old Agadir before the 1960 earthquake which destroyed the city. The colourful bustle of the port, the fishing fleet and fish auction. A drive in the town centre with its residential quarters, visit of a Moroccan handicraft centre and walk in the souk, daily. The « Pearl of Souss » Taroudant is one of the oldest fortified cities in Morocco, first capital of the Almoravides dynasty in early 11th century. A half day trip across the fertile Souss valley to this ancient trading centre with its craftsmen and colourful markets, through the narrow shaded bustling streets. The Medina of Taroudant has resisted the influences of the ages and has conserved the magnificent ochre colored cob ramparts. 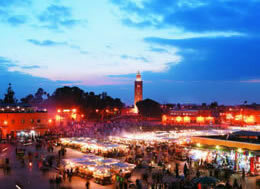 Its intriguing souks situated around Assarag Square or the Berber market, at Tamaklate Square, is all "must see" places. They offer both inhabitants and visitors long passageways of shops containing jewellers, antique dealers, and stone sculptors. The handicrafts in Taroudant are inherited from traditions that are centuries old. Berber carpets, excusive leather goods, famous for their elegance and the talent of its master tanners and leather workers, are also available as are finely etched and worked silver objects. 3500 feet into the heart of the Anti Atlas Mountains, the small villages are surrounded by the pink granite rocks amidst the palm trees. On return, stop off to visit Tiznit, famous for its silver craft. 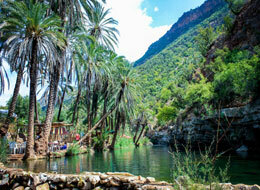 The trip to Tafraout is truly one of the most dramatic trips in Morocco. The landscape consists of outstanding pink granite and when the almond trees are in flower the scenery is absolutely breathtaking. The city itself is a centre of Berber culture in every sense of the word and is rich in language, architecture, arts, and social practices. The Berber people of this region originate from the Ammeln tribe, they are known for their business skills and have set up countless small grocery stores throughout Morocco an as far away as Europe. Most are open day and night. 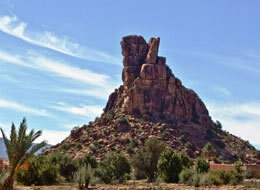 North of Agadir, in the foothills of the western part of the High Atlas, is the Imouzzer region inhabited by the Ida Ou Tanane tribe. The central portion of this Berber territory, is considered to be one of the most picturesque areas of the Souss. The total circuit from Agadir-Imouzzer-Bigoudine-Agadir, is 210 km. But only 35 km from Agadir, you will experience a dramatic change in the environment which includes such features as mountains, canyons, cascades, palm groves, and isolated villages in the valleys. The road to Immouzzer is an eco-tourists dream with the chance to experience wilderness, the hospitable Berbers and dramatic scenery. The drive passes through some lovely scenery, high mountains, palm groves and narrow canyons, before reaching the village. Beyond are pretty waterfalls flowing down the rock face into a small lake surrounded by olive groves. Morning departure to the Imperial city of Marrakech. Most of the city architecture attractions are inside the Medina, the old walled section of town. Built in the 12th century, the Koutoubia Minaret is the most perfect Islamic religious structure in North Africa. Hidden away behind high walls are the Saadian tombs. The Bahia palace is a masterpiece of domestic architecture. In the afternoon, drive to the old town and walk through the labyrinth streets of the souks with their quarters and corporations, dyers, herbalists, jewellers, carpenters, and hundreds of craftsmen on their work process. The tour ends at the DJemaa El Fna square, a big popular fairground with its storytellers, fire-eaters, jugglers, fortune-tellers, snake charmers and performers of each and every sort. Drinks are served on a terrace with views overlooking the square. Day trip in the old fortified fishing port of Essaouira on the Atlantic coast. Founded in the 16th century by the Portuguese and occupied by them till the mid 18th century when the Trans- Saharan trade routes fell apart. The present town dates from the 18th century reconsidered and re-structured by the king Mohamed Ben Abdellah to widen the trade with European countries. 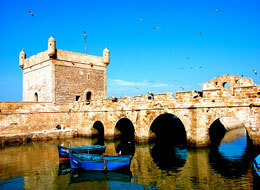 See the impressive town fortifications consisting of an amazing mixture of Portuguese and Berber military architecture. Explore the souks and the carpentry workshops devoted to cedar and thuya wood carving. See art galleries which are dotted in the city and visit the harbour with its stalls of freshly caught barbecued fish.